Kemo the Blaxican bringing you the heat on his latest album "Upside of Struggle" available here! 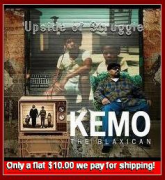 News Kemo the Blaxican bringing you the heat on his latest album "Upside of Struggle" available here! The soulful style and hard-hitting beats grab you first. Then you hear the smooth-yet-powerful baritone vocals deliver with a distinctive tone. You recognize the voice as it commands attention with provocative lyrics over the flavorful track. This MC shifts the rhyme from English to Spanish, and then back to English again seamlessly. Your head nods the whole way through and it doesn’t matter if you can’t understand the Spanish parts. Then it hits you…the voice and trademark rhyme-flow belongs to none other than “Kemo The Blaxican,” former member of urban-Latin hip hop pioneers, “Delinquent Habits,” whose highly-anticipated album, Upside of Struggle, is slated for release nationally Tuesday, August 17, 2010 on Dead Silent Records. His new CD, Upside of Struggle, is series of hip hop tracks inspired by his roots; specifically southern California culture and the music that influenced his youth—from west coast funk, soul, and classic hip hop, to traditional Latin music. The album also features guest appearances by Sen Dog (Cypress Hill) and Tetsuya Weeping Willow Nakamura (formerly of War) on the track“Just What You Feelin,” as well as contributions by Sick Jacken (Psycho Realm) on the album. Kemo The Blaxican is a former MC and lyricist for West Coast Latin hip hop pioneers, “Delinquent Habits.” Before Kemo went “solo,” he was most notable as the brainchild of Delinquent Habits (DH), who happened to also be the only Spanish-fluent MC in the group. He spent twelve years with the collective, with whom he released four albums, and took the Delinquent sound around the world. In 1996 the group struck gold with their very first single "Tres Delinquentes,” a song that masterfully fused a traditional mariachi sound (courtesy of Herb Alpert's "Lonely Bull") with the raw hip-hop backdrop of the streets. The sound was a breath of fresh air in a stale rap scene, and opened a new creative doorway into which many other Latin hip hop acts would follow. "Tres Delinquentes" blew up almost overnight, receiving airplay not only on hip-hop radio but rock and Top 40 stations as well. The track eventually landed Delinquent Habits an appearance on the former-NBC show, “Late Night with Conan O'Brien” and tours with heavyweights like Korn and Ice T. In no time, "Tres Delinquentes" became a worldwide hit, selling over one million copies around the globe and pushing the group’s self-titled album to nearly the same figure. This was the public’s first introduction to Kemo's lyrical skills and flawless bilingual transitions. He stepped into the hip-hop game, introduced himself as “The Blaxican,” and never looked back. Four Delinquent Habits albums later—after countless tours around the globe including the UK, Europe, Japan, South America, Mexico and Taiwan—Kemo left the group and embarked upon his solo career. Kemo walked away having played a major role in solidifying Delinquent Habits as one of the most influential Latin hip hop groups of all time and establishing himself as one of today’s leading bilingual MC's. The solo move has allowed him to record Simple Plan, Not So Rich & Famous, and Upside of Struggle on his own indie label, Dead Silence Records. Kemo reminds us with Upside of Struggle that the life has its highlights and hardships. Each track on the album increases with dynamism, as Kemo envokes emotion through his beats and words. Kemo The Blaxican is always on the move. In 2001, the bilingual LA rapper recorded a song with Grammy-winning merengue queen, Olga Tanon, and Egyptian singer Hakim. The track fused hip hop, merengue, and modern Middle Eastern sounds and was a mainstay on the charts from the Middle East to the West Coast. On top of it all, he is also the proud owner of indie record label, Dead Silence Records and the urban fashion t-shirt line, Joint Clothing. Kemo also works successfully in publishing, garnering his music in numerous national T.V. ads and films for over a decade. His latest album is available here for our TLA readers at a discounted rate only a flat $10.00ea. we pick up the tab for shipping and handling, just click on "BUY NOW" icon to the left next to the picture of the album and enjoy!